Tel. ++41 1 633 31 44, Fax. ++41 1 633 10 64, Email : koeppel@ibk.baug.ethz.ch. In order to investigate fracture mechanisms in concrete, quantitative acoustic emission (AE) techniques can be applied. In this context a 3D localization of the recorded AE events is required. In a first step experiments were carried out to evaluate the influence of various factors on the accuracy of localization results. AE sources were either artificially generated on the surface of the specimens or obtained from loading tests. An eight channel acquisition unit was used to record AE parameters and waveforms. The quality of arrival time determination was found to be crucial for the localization and could be improved with the employment of an energy based algorithm. In a second step selected AE events, recorded during pull-out tests, were analyzed quantitatively. With the help of a relative moment tensor inversion technique AE source characteristics could be recovered. AE is defined as the spontaneous release of localized strain energy in a stressed material resulting, for example, from microcracking and can be recorded by transducers (sensors) on the surface. AE analysis is a useful method for the investigation of local damage in materials. One of the advantages compared to other NDE techniques is the possibility to observe damage processes during the entire load history without any disturbance to the specimen. More sophisticated analysis procedures, such as fault-plane solution or moment tensor inversion methods, are applied to investigate the failure mechanisms of AE sources. Therefore AE technique has to be used in a quantitative way based on the recorded surface displacement transients (waveforms). The use of six or more transducers is required to determine the radiation pattern of a general AE source. Fracture type, size and orientation can be deduced. The basis for these quantitative methods is a localization technique to extract the source coordinates of the AE events as accurately as possible. With the localization of AE sources, damage or material flaws can be detected. If AE source characteristics are to be analyzed quantitatively in order to investigate damage mechanisms, the knowledge of the source locations is a requirement. Source locations are calculated based on differences in arrival times of the emitted p-wave at different transducers. Four transducers have to be employed to determine the unknown source time and the three source coordinates uniquely. The corresponding system of nonlinear equations is solved by an iterative algorithm. With the use of more transducers the solution can be improved. Applying a least squares approach, time residuals at the different transducers are calculated and random measurement errors can be recognized. Mean residuals correspond to the theoretical accuracy of the localization result. The accuracy and reliability of the localization is influenced by various factors. With a reasonable transducer arrangement for the given problem, the chosen localization algorithm is of minor importance. For applications where the approximate source locations are known prior to testing, the transducer array geometry can be optimized. The p-wave velocity, used for the localization algorithm, influences the result but can be easily determined through calibration. As the observed wavelengths are usually larger than the maximum aggregate size in concrete, a more or less homogeneous and isotropic distribution of the p-wave velocity can be assumed. The quality of the arrival time determination (picking) is the most crucial factor for the accuracy of localization results. In order to obtain reliable source locations it is necessary to ensure the correct picking of arrival times. Commercial programs usually take the first threshold crossing at a transducer for the arrival time, which is very simple but not always accurate. A manual determination of arrival times allows one to improve the results significantly but is time-consuming and not reasonable in most cases in view of very large amounts of data. Therefore an appropriate localization program Hypo AE was developed by Oncescu and Grosse . The non-trivial problem of the automatic extraction of arrival times was solved by an implemented algorithm WinPecker, taking into account waveforms, signal energies and noise conditions , . WinPecker can be operated in different modes. Besides the automatic mode, where the operator has only little influence on the picking process, a semiautomatic mode was established, in which manual corrections are possible. As an example Figure 1 shows this visual process for one event recorded by eight transducers. The small vertical lines mark the arrival times suggested by the program. Fig 1: AE event #401 recorded at eight transducers. Example of the arrival time determination (vertical lines) using WinPecker. The detail-window in the upper right corner gives better control over the picking process. The result of the hypocenter determination (in meter) is shown in the status row at the bottom . Influences on the accuracy and reliability of localization results in concrete were to be investigated. It was therefore necessary to know the actual source locations. Experiments were carried out with artificial sources (pencil breaks) at defined positions on the surface of the specimen. Loading tests were designed to produce AE due to cracking or friction in small and predictable regions. For all specimens normal density concrete with 330 kg of Portland cement per m 3 and a water-cement ratio of 0.47 was used. The mix proportion was 0.35 : 0.3 : 0.35 for aggregate sizes 0-4 : 4-8 : 8-16 mm. A commercial AE measuring system was used to acquire AE data during the tests. Eight channels with transducers, preamplifiers and A/D converters were employed simultaneously. Piezoelectric transducers (PZT) with a broadbanded and calibrated frequency response between 50 and 250 kHz and a diameter of 13 mm were applied. Besides conventional AE parameters also transient waveforms were stored over a length of 205 ms with a digitizing rate of 10 MHz. Source locations of AE events recorded by all eight transducers were calculated online by the acquisition unit and in a subsequent analysis using HypoAE . For the p-wave velocity a value of 4.8±0.1 m/ms was determined in preliminary tests and found to be equal within the given bandwidth for all specimens. In a first experiment, localization results of pencil breaks on a concrete cube (sidelength 200 mm) were compared with the actual positions. The source locations displayed in Figure 2b were calculated online using the first threshold crossings as arrival times. For the locationsin Figure 2c WinPecker was applied to determine the arrival times from the recorded waveforms. Only a small improvement was achieved and localization errors ranged for both algorithms from 0 to 5 mm. The respective distributions are plotted in Figure 2d, where the vertical axis is normalized to the absolute number of localization results. Fig 2: (a) Pencil breaks on a concrete cube; Projected localization results (·) and error vectors (-) using arrival times (b) equal to the first threshold crossing and (c) determined by WinPecker; (d) Distribution of localization errors in the xy-plane (cumulative plot). A series of pullout tests was carried out to examine AE signals caused by the interaction of steel and concrete in the bond zone. Four concrete cubes with side lengths of 200 mm and a centered rebar f 14 mm were used (Figure 3). The bond length was chosen as 42 mm which equals three rebar-diameters or five rib-spacings. AE signals were first caused by the loss of adherence at the steel-concrete interface and then through shearing action in the concrete between the steel ribs. The actual failure zone was restricted to the very close vicinity of the bond surface. Fig 3: (a) Test setup for pull-out tests with dimensions in [mm]; (b) Picture of a specimen cut in half after testing. The load F was increased in several steps up to failure (Figure 4a). Throughout every test about thousand AE events could be localized with a sufficient theoretical accuracy. Localization results plotted in Figures 4b and 4c were obtained in one loading step. Applying the two above described ways to determine the arrival times lead to significantly different source locations. Actual source locations are unknown, but the calculated ones in Figure 4c are more likely to be correct considering the observed failure. As shown in Figure 4d, they are mainly located within 10 mm of the rebar surface. Fig 4: (a) Load-slip behavior of pullout test, highlighted section with AE-events displayed in this figure; Localization results using arrival times (b) equal to the first threshold crossing and (c) determined by WinPecker; (d) Distribution of the horizontal distance between lo-calized AE-source and axis of the rebar (cumulative plot). AE signals obtained in this experiment were generally weaker and less uniform than the pencil breaks used in the first experiment. It seems that under these circumstances WinPecker considerably improves the accuracy of arrival time determination. Within quantitative AE analysis, source characteristics are deduced through the analysis of the recorded waveforms. They are however not only affected by the source mechanism but also by the wave propagation through the medium (Greens'functions), and the measuring process (system transfer function). In order to extract the source characteristics from the measured signals it is necessary to eliminate the other effects. This can be accomplished by a deconvolution. Several authors have successfully applied moment tensor inversion to characterize cracking mechanisms in concrete , . The six independent components of the symmetric moment tensor represent force dipoles and describe the radiation pattern of a general AE source. The deconvolution requires that the Green's functions and the system transfer function have to be determined through calibration prior to testing. For the calculations, the Green's functions are simplified and assumed to be valid throughout the entire specimen. An alternative method was developed by Dahm , . With this relative moment tensor inversion (RMTI) the radiation pattern of clustered AE sources can be recovered. Assuming the propagation conditions to remain unchanged for all sources within the cluster, the Green's functions and the transfer functions can be eliminated and need not be determined. The moment tensors for each AE source are calculated using its source location and the first p-wave amplitudes measured at six or more different transducer locations. The method is based on the assumption that the ray theory is valid and that near field terms can be neglected. AE sources are approximated as point sources and their relative distance within a cluster must be smaller than the emitted wavelength l (around 30 mm). The eigenvalue analysis of the moment tensor leads to the principal directions of compression P and tension T and to a decomposition into isostatic ISO and deviatoric components. For the further interpretation it is useful to separate the deviatoric components of the moment tensor into two double couples DC, standing for shear mechanisms, and into a compensated linear vector dipole CLVD. For a classification of AE sources, different tensor components are quantified by the corresponding ratios. While this interpretation of the moment tensor is analogous to seismic applications, different interpretations are possible. It has been shown by other authors that crack orientations and crack opening directions can be deduced , . AE events recorded during the above described pull-out tests were analyzed applying RMTI. Based on the source locations and the p-wave amplitudes measured at eight transducers, the moment tensors were calculated with the use of a program developed by Dahm. The determination of the p-wave amplitudes was done manually because it seemed crucial for the quality of the result. As a disadvantage the procedure became rather time-consuming and only a few selected events were analyzed so far. The following results were obtained from the analysis of 13 events in two clusters located on different sides of the reinforcing bar in the bond region. In Figure 5a the projections of AE-source locations are displayed in a top view of the specimen. The calculation yielded the moment tensors for each AE event. In a first interpretation principal directions P and T were determined and are plotted for every source in a side view of the bond region (Figure 5b). Fig 5: RMTI-Results from pull-out test: (a) AE-sources of two different clusters in a top view of the specimen; (b) Projection of the source locations and corresponding P- and T-axis in a side view. More detailed information on the source characteristics for each event is given in Figure 6. The graphs show projections (Lambert equal area projection) of the P and T axes on the lower focal sphere. Besides the moment tensor components also the respective standard deviations are estimated by the inversion routine. The gray dots in the graphs correspond to the P and T axes determined from 200 tensors whereby normally distributed errors, proportional to the estimated standard deviations, were added to the tensor components. This visualization of the errors allows one to evaluate the quality of the inversion result and to recognize uncertain solutions. Below the graphs the relative values for the different components of the moment tensor are indicated. The exact definitions are given in . ISO stands for the isostatic component. The DC value corresponds to the shear portion within the deviatoric component. CLVD is not shown but corresponds to 100 % - DC. MR relates to the relative strength and SM to the relative seismic moment which is proportional to the energy emitted by the source. Fig 6: Calculated P and T axes of AE sources in Clusters 1 and 2. The best solutions are repre-sented by a cross and a star respectively. The uncertainty of the solution is indicated by gray dots, calculated with normally distributed errors resulting from the inversion rou-tine. With the exception of events 47 and 256, shear mechanisms with a very low isotropic component are dominant. The P axes are very steep, while the T axes are close to horizontal. In the azimutal direction both P and T axes point more or less radially from the source location to the center of the rebar. The results of both clusters correspond well with expectations, assuming the AE events to be caused by shearing action in the concrete between the ribs of the reinforcing bar. AE experiments with reinforced concrete were carried out in order to evaluate different influences on the accuracy of localization results. The quality of arrival time determination was found to be crucial and could be improved with the employment of an energy-based algorithm, implemented in the WinPecker program. The relative moment tensor inversion was applied in order to analyze AE events recorded during pull-out tests. The principal directions of the calculated moment tensor as well as its decomposition into isostatic and deviatoric components allowed one to characterize different source mechanisms. Only a few results have been obtained so far but the agreement with expected failure mechanisms is promising. Problems were encountered with the time-consuming and not always unambiguous determination of the p-wave amplitudes used for the inversion. The authors wish to thank Dr. Lani Oncescu and Dr. Torsten Dahm for their technical support regarding localization and inversion algorithms. Furthermore, the authors are grateful for the collaboration of Prof. T. Vogel and Prof. H.-W. Reinhardt. The financial support of the Swiss National Science Foundation is acknowledged. Aki, K.; Richards, P.: Quantitative seismology - theory and methods. Allan Cox; W. H. Freeman and Company, San Francisco (1980), 932 pp. Dahm, T.: Relative moment tensor inversion based on ray theory: theory and synthetic tests. Geophys. J. Int. 124 (1996), pp. 245-257. Grosse, C.: Grundlagen der Inversion des Momententensors zur Analyse von Schallemissions-quellen. In: "Werkstoffe und Werkstoffprüfung", Festschrift zum 60. Geb. von Prof. Reinhardt (Hrsg. C. Grosse), Libri BOD (1999), pp. 82-105. Grosse, C.; Weiler, B.; Reinhardt, H.: Relative moment tensor inversion applied to concrete fracture tests. J. of Ac. Emission 14 (1996), No. 3-4, pp. 74-87. Grosse, C.; Reinhardt, H.; Dahm, T.: Localization and classification of fracture types in concrete with quantitative acoustic emission measurement techniques. NDT&E International, Vol. 30 (1997), No. 4, pp. 223-230. Grosse, C.; Reinhardt, H.: Entwicklung eines Algorithmus zur automatischen Lokalisierung von Schallemissionsquellen. Die Materialprüfung 41 (1999), pp. 342-347. Grosse, C.: WinPecker - Programm zur vollautomatischen dreidimensionalen Lokalisierung von Schallemissionsquellen. 12. Kolloquium Schallemission, DGZfP Berichtsband BB 72 (2000), pp. 191-204. Köppel, S.; Vogel, T.: Localization and identification of cracking mechanisms in reinforced concrete using acoustic emission analysis. Proc. 4. Int. Conf. on Bridge Management, Surrey (2000), pp 88-95. Landis, E.; Ouyang, C.; Shah, S.P. : Automated determination of first p-wave arrival and acoustic emission source location. J. of Ac. Emission 10 (1991), No. 1-2, pp. 97-103. Landis, E.; Shah S.P. ; Signal analysis for quantitative acoustic emission testing. Nondestructive Testing Methods; ASCE; New York (1995), pp. 45-56. Ohtsu, M.; Shigeishi, M.; Iwase, H.; Koyanagi, W.: Determination of crack location, type and orientation in concrete structures by acoustic emission. Mag. of Concrete Research 43 (1991), No. 155, pp. 127-134. Ohtsu, M.; Okamoto, T.; Yuyama, S.: Moment tensor analysis of acoustic emission for cracking mechanisms in concrete. 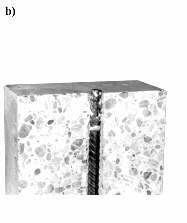 ACI Structural Journal 95 (1998), No. 2, pp. 87-95. Oncescu, L.; C. Grosse:HYPO AE - A program for the localization of hypocenters of acoustic emissions. Software für PC und Workstation, Rev. 2.0 (1996), 15 pp.